Wedding PR: Brit + Co, Brides.com, Catersource and more! We’re here for another wonderful week of client features, including Brit + Co, Brides.com, Catersource and so much more! We’ve got all the fun below. 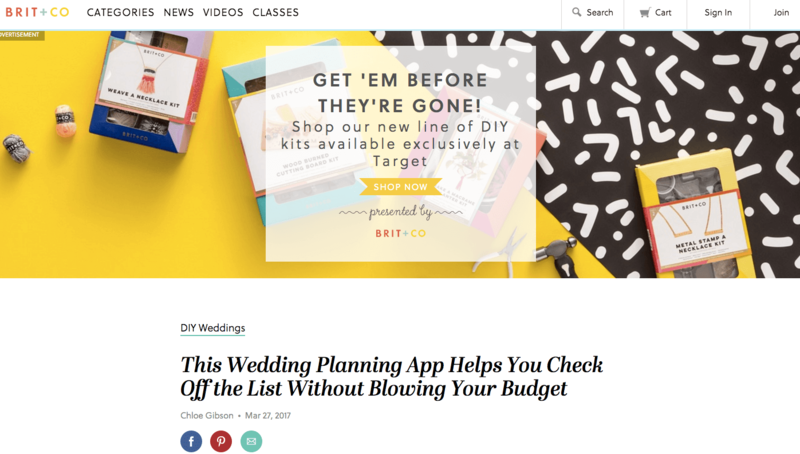 LadyMarry was featured on Brit + Co in their article, This Wedding Planning App Helps You Check off the List Without Blowing Your Budget. See the full article here. Cocoon Events and International Academy of Wedding and Event Planning was featured in the Brides.com article, How to Work These 2017 Wedding Trends Into Your Big Day. See the full feature here. 100 Candles was featured on AllSeated with their guest article, A Guide to Shopping for Wedding Candles. See the full feature here. LadyMarry was featured on Yahoo.com in their round up of, The Best Apps for Wedding Planning. See the full article here. Destination Weddings was featured on Catersource with their guest article, Eco-Friendly Touches for 2017 Destination Weddings. See the full feature here. Nahid’s Global Events was featured on Think Shaadi with a real wedding feature, Neha and Shae: A Beautiful Wedding in California. See the full feature here. Destination Weddings, Cocoon Events, Rochelle Cheever Photography, Passport to Joy, and Belladeux Event Design were featured in the Canadian Travel Press. See the full feature here. Fantasy Sound Event Services was featured on Catersource with their guest article, Time Management and Your Inbox. See the full article here.